Expansion sound sets can be used on their own or merged with the host device sound set allowing both to be used at the same time. We'll merge expansion and host sound sets you've purchased from us free of charge on request; for a small one-time additional fee we can merge your expansion with any sound set that's not ours. Contact us for details. The SRX-05: Supreme Dance must be purchased separately. This product facilitates use of the SRX-05: Supreme Dance in Sibelius. IT IS NOT A SOUND DEVICE and DOES NOT CONTAIN ANY SOUNDS. To purchase the SRX-05: Supreme Dance device, please visit the Roland website. 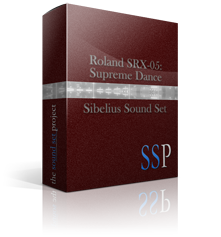 SRX-05: Supreme Dance © Roland Corporation.